Cameras are optical devices used for recording images, either as individual still photographs or as part of a series of images such as in a video. Cameras operate using electronic sensors or photographic film to capture visible light or other segments of the electromagnetic spectrum. The first lasting photograph was made in 1826, captured on pewter covered with bitumen. Today most consumers own a camera of some type or another, and in 2016, global revenue for cameras and camcorders amounted to about 13 billion U.S. dollars. Widespread consumer photography was made possible by the invention of photographic film in 1888 by the company Kodak. In 1975 Kodak would also go on to develop the first camera that used digital electronics to capture and store images. In 1986, Japanese company Nikon introduced the first digital single-lens reflex (DSLR) camera. In 2000, the world's first digital camera phone, was introduced by Sharp and, by the early 2010s, almost all smartphones had an integrated digital camera. The Camera & Imaging Products Association (CIPA), the Japan-based industry association which includes members like Canon Inc., Nikon and Sony, is a towering presence in the camera industry. 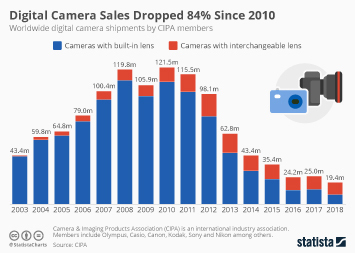 In 2017, CIPA companies' shipments of digital still cameras amounted to about 25 million worldwide. Technological advancement, especially in the past decade, has led to smaller, more durable cameras that can be used for purposes never thought possible in the past. Compact, easy-to-use cameras such as action cameras and wearables have quickly become some of the most popular stand-alone cameras on the market. Global unit sales for action cameras were expected to reach 11 million units in 2017, while unit sales for wearable cameras were projected to amount to over 14.8 million units. Perhaps the most popular brand in the action camera industry, GoPro, reported revenues of nearly 1.2 billion U.S. dollars in 2017. Another popular type of stand-alone camera, the body-worn camera, is expected to see huge sales increases in the coming years, with forecasted unit shipments rising from 1.6 million in 2018 to 5.6 in 2021.